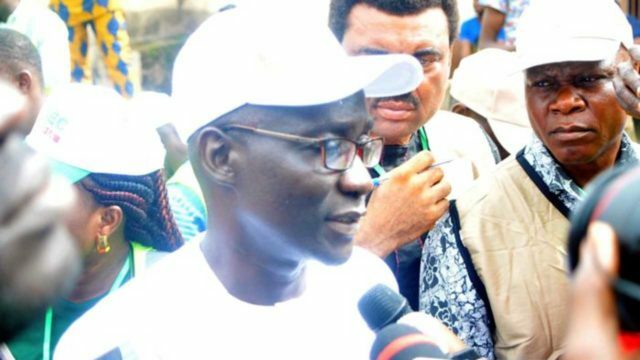 Professor Olusola Eleka, the PDP candidate in the Ekiti governorship election finally cast his ballot at 11.15 a.m following the intervention of National Commissioner of INEC, Professor Anthonia Taiye. The INEC card reader had rejected Eleka’s PVC and his wife’s twice. Following the intervention of the INEC national commissioner, Eleka was manually accredited and allowed to vote. Eleka thanked the INEC commissioner for creating alternative means for him to cast his vote. He appealed to the National Commissioner of INEC to ensure that all the card readers in Ikere Ekiti polling units are functioning properly. Taiye, who supervised voting in the area had promptly assured Eleka, at a press briefing that he would cast his vote, after she was notified. She said that some of the major reasons why the card reader often rejects the PVCs was because the owners often tamper with the sensitive part of the card and whenever it happens, the machine would reject the card. ” Card readers often reject card whenever the sensitive parts are tampered with. ” In the case of Prof. Olusola Eleka, I have contacted our ICT operators and the head office in Abuja and they are currently working on it and I want to him that he would vote before the vote ends,” she said.